A back-to-back exhibit of Rommel Manto and Paul Sena is on show the whole month of April at Chef Jessie Rockwell Club at the Ground Level, Amorsolo Square, Amorsolo Drive, Rockwell Center, Makati. No other two artists could have been more different. Manto finished Fine Arts at the University of Sto. Tomas. He then led a professional life doing everything creative – book illustration, mascot production, murals, stage design, print ads, billboards, logos. Some of his works he did while at the Cultural Center of the Philippines. His natural talent he supplemented with extensive knowledge of computer graphics. 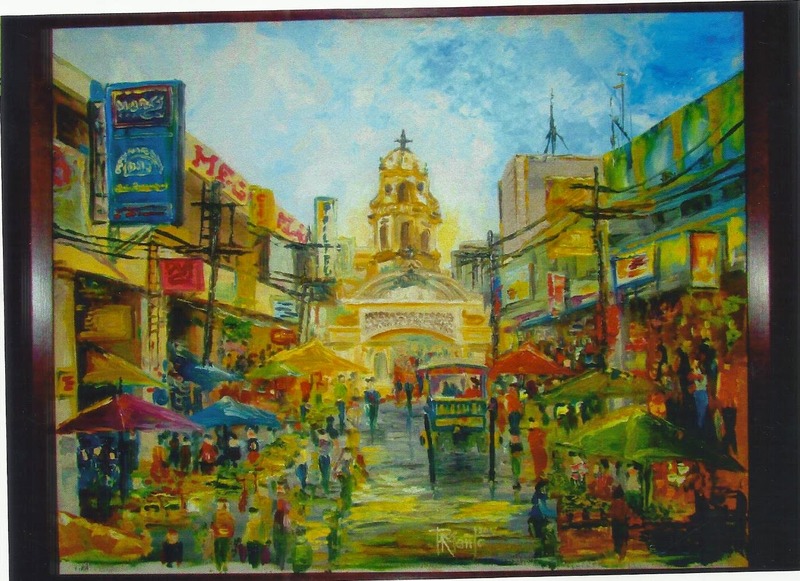 One of Manto’s works in the exhibit is “Carriedo,” a colorful oil depiction of the hustling and bustling commercial and business hub of Manila. Paul Sena regards himself as a self-taught painter. His contemporaries call him an “Artistang Bayan,” touching on subjects that depict the everyday comings and goings of life – a construction worker doing his share to build the nation, a mother tending to her child, a child bent down on his studies, fishermen hauling in a catch. 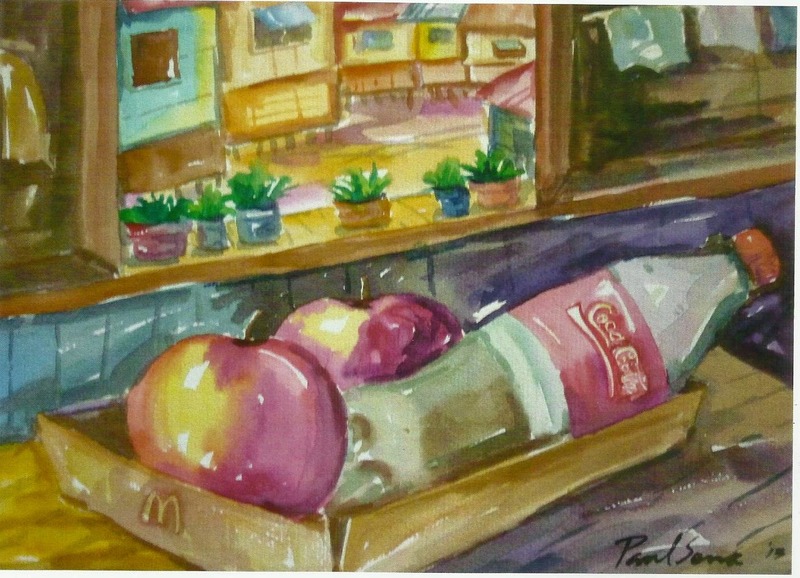 His watercolor piece “Apol, Makdo at Kok” is a playful still life showing two of the world’s most popular brands with huge apples by a windowsill. Sena came from humble beginnings, growing up in Tondo with his parents and equally creative siblings. He was a winner in the Shell Art Competition and a finalist in the Metrobank Art Competition. He has served as art instructor and has had several group and solo shows, one of which was with fellow artists Antipas Delotavo and Nemiranda.